Studs Terkel has 1 media appearance. Berwyn Public Library discusses P.S. : Further Thoughts from a Lifetime of Listening. 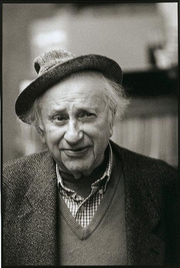 Studs Terkel was born in New York City to Russian Jewish immigrants. He moved with his parents to Chicago where his parents ran a boarding house. Though graduating from law school, Terkel chose not to practice law. He joined a theater group and did other work until he began writing. In the 1950's, he was blacklisted from television for refusing to sign a loyalty oath to CBS. He was married to social worker Ida Goldberg for 60 years before her death in 1999. Studs Terkel is survived by one son, Dan Terkel. Studs Terkel is currently considered a "single author." If one or more works are by a distinct, homonymous authors, go ahead and split the author. Studs Terkel is composed of 16 names. You can examine and separate out names.